Wintika is a betting site operated and owned by HighWeb Ventures N.V. Since 2015, the site has been providing players with HD casino games and various sports events. Members of the online bookie will be at ease that the games offered are fair as these have been tested by iTech Labs. 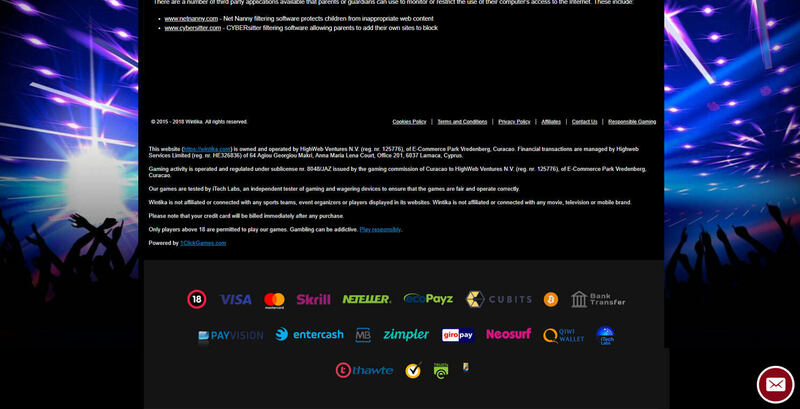 Unfortunately, the gaming hub focuses more on its Casino and Vegas sections. But should this hinder you from joining Wintika as a sports punter? Find out in this thorough review. Wintika offers two bonuses to sports bettors: cashback and VIP club. Learn more about these rewards below. You can get a 21% cashback by playing virtual sports games. All you have to do is have at least €1 rebate payment per day. Take note that you cannot activate this bonus if you are residing in China, South Africa, Singapore, and India. By playing on Wintika, you can earn points that can give you exciting deals such as deposit bonuses, free withdrawals, and birthday bonuses. The more points you accumulate, the bigger rewards you gain. Below are the different VIP levels and treats up for grabs. New customer – No points are required to get deposit bonuses, live chat and email support, and newsletter bonuses. Bronze – You need one to 499 points to get the same rewards as new customers but with free loyalty bonuses and free withdrawals. Silver – You need 500 to 2,999 points to get the same gifts as bronze members but with exclusive access to competitions and birthday bonuses. Gold – You need 3,000 to 20,000 points to get the same treats as silver members but with VIP manager and support and faster payouts. Diamond – You need more than 20,000 points to get the same incentives as gold members but with invitations to VIP events and VIP cash bonuses. Take note that you can have the free withdrawals bonus as long as your payment method is not SEPA bank transfer. There are other bonuses available on Wintika such as deposit bonus and daily rebate. But these gifts are exclusive for casino players only. You will not find a wide variety of sports on Wintika. The online bookie has only nine sports available which are soccer, tennis, basketball, volleyball, ice hockey, baseball, table tennis, American football, and cricket. Even if there are just a few sports offered, you will find a wide selection of betting types. You can choose from among double chance, draw no bet, and correct score, to name a few. You can also wager on live events if you prefer betting in real time. There is even the Virtual Sports section where you can wager on virtual games such as horse racing, dog racing, car racing, dart, and badminton. 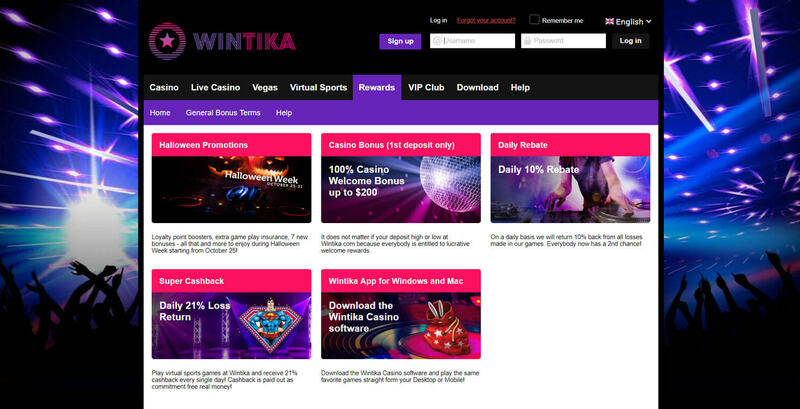 For more games, you can go to the Casino, Live Casino, and Vegas sections of Wintika. Here, you will find a wide array of titles from the biggest names in the industry. Wintika supports various fiat currencies such as AUD, USD, and EUR. You are allowed to pay using BTC as well. There is also a long list of payment methods available. Just be sure to check the supported currency of your chosen payment method before sending your funds. All deposit processes are done instantly except for Cubits. If you choose this deposit option, you need to wait for up to an hour before your funds reflect in your account. The maximum amount that you can withdraw is €10,000. You also need to wait for three to five days before you can withdraw your funds. Wintika: Is It Worth It? Wintika is a great casino to play in, but it is not focused much on sportsbook. The online bookie has only around nine sports and two bonuses offered. There are a lot of other sportsbooks that can give you over 30 sports with a long list of sports bonuses. The sportsbook also has a lot of country restrictions. So you cannot always be sure that just because you can access the casino, you can bet on the sportsbook section as well. This is why you should contact the live chat support of the betting site and ask if your location is not part of the country restrictions of the online bookie. With limited sports, few bonuses, and various country restrictions, Wintika is not the best option for sports bettors like you. But if you are looking for a fun casino experience, this betting site stands as a fair choice.